15 static gobos (+ open) and 14 colours (+ open and split colour options) allow the light beam produced by 1RE Beam’s potent discharge lamp to be shaped and coloured in a host of ways offering lots of creative potential. 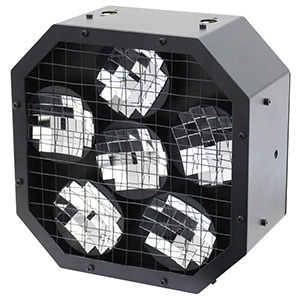 In addition, an 8 facet rotating prism allows further exciting effects to be generated. The fixture offers a wide range of pan and tilt movement - 540-degrees and 270-degrees respectively – as well as 16-bit positioning for exacting control and smooth movement. It also offers 0-100% dimming as well as strobing at variable speed. While feature packed and powerful, the 1RE Beam is both lightweight and compact. The fixture weighs 9.2kg and measures 405 x 279 x 225mm. In features professional PowerCON input and output sockets and its low power draw of 199W means that multiple fixtures can be daisy-chained from a single power supply. For DMX control 12 channels are used, while Pan and Tilt inversion options - as well as Pan and Tilt macros - are provided to aid with programming. An LCD display, along with four push buttons, allow for easy DMX addressing as well as configuration of the various operating options. The eLumen8 1RE Beam will be available from the end of June with a two-year warranty as standard. The Suggested Selling Price is still to be confirmed, but it will be significantly lower than that of its big brother the 5RE (which is £799 inc. VAT).